Does anyone have any more information on this property? Does it looks like they'll hit their target date? We'll be in Hong Kong at the end of November, and are thinking of popping over to Macau while we're there. Looks like they've bumped the date to June 2012. Is this actually a brand new hotel? The web page says it will be open as of September 20, 2012. We're actually looking at staying here on 9/29 for one night. Will the property actually be open? I have it on good word that it'll be open by then. It's brand new (drove past it en route to Westin Macau the other weekend). Was informed by my colleague that it will be opened in September 20, 2012. Can someone update the title of this thread please? Visit Starwood Lurker II's homepage! Thanks for the updates. The wife and I are a bit excited to stay in a hotel that is only 9 days old. The hotel is Category 4, and we booked a C&P res for one night. We're embarking on a 5-week trip through SE Asia, and we're jamming a night in Macau after four nights in HKG and before we head off to Bali. •Offer is valid at Sheraton Macao Hotel, Cotai Central for stays booked between August 20 and August 31, 2012 and consumed between September 21, 2012 and March 31, 2012 on DAILY0A rate plan when booking online, or HOTOFFER rate plan when booking through a travel agent or one of our customer contact centers. •All package amenities associated with this promotion are per room, per eligible stay and include HKD 200 voucher which can be redeemed for any hotel products or services as specified on the voucher during your next stay at the Sheraton Macao Hotel, Cotai Central. The voucher cannot be used towards hotel accommodation payment. •Voucher will be provided during your check-out by the front desk staff. 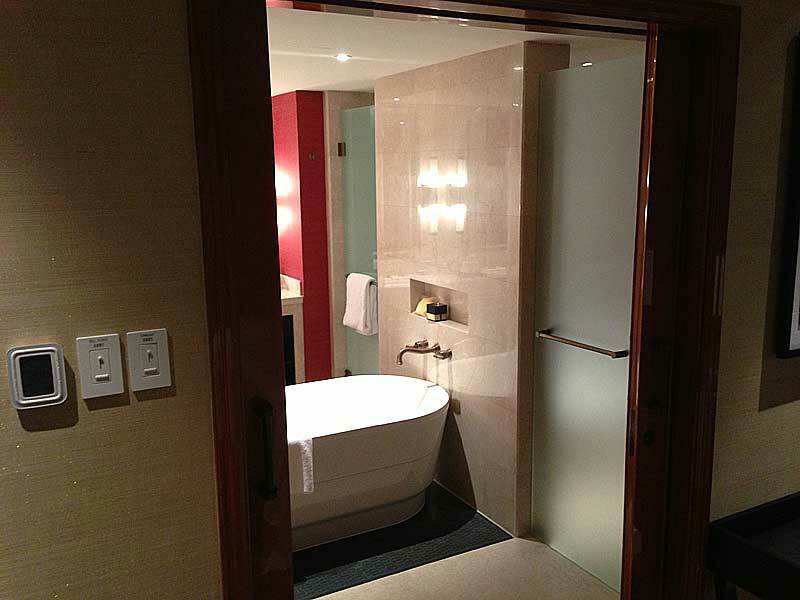 •Room rate is subject to 10% service charge and 5% government tax. •Advance purchase required. Credit card will be charged at time of booking. Reservations cannot be changed, are pre-paid and non-refundable; if cancellation takes place, guests forfeit total room charge plus tax. •A limited number of rooms may be available at these rates. •Blackout dates and other restrictions may apply. •Offer not applicable to groups. •Not to be combined with other offers or promotions and subject to change. •Not responsible for omissions or typographical errors. •Void where prohibited by law. •Starwood reserves the right to discontinue this offer at any time. •Starpoints, SPG, Starwood Preferred Guest, Sheraton, Four Points, W, Aloft, Le Méridien, The Luxury Collection, Element, Westin, St. Regis and their respective logos are the trademarks of Starwood Hotels & Resorts Worldwide, Inc., or its affiliates. 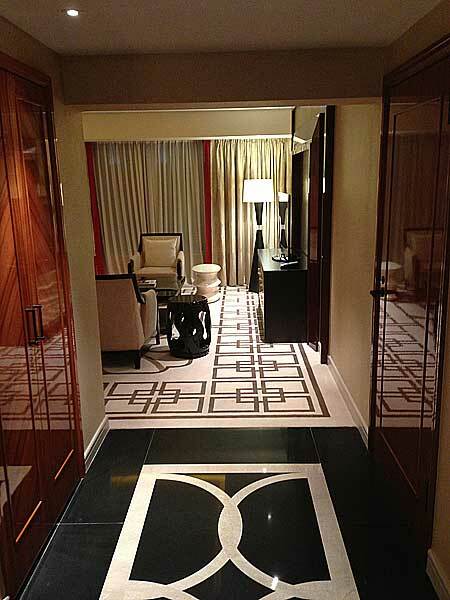 True that comparing prices to HKG is like comparing Apples and Oranges but hotel prices in Macau are so much cheaper..
Conrad Macau is an amazing hotel and treats you extremely well if you have status -- Huge suite & great lounge for Diamonds. And I've stayed on rates as low as HKD900. I will try the Sheraton once it opens, but it's safe to assume that it pales in comparison to the Conrad ... even if Plat recognition is decent, the comparator will likely be the HI, not the Conrad. Pales in comparison to the Conrad? I think the variations between the Conrad, Sheraton, and even HI in this Sands/Cotai development are smaller than many realize. I just got back from a 1-night stay at the Sheraton Macau. The room I was in was definitely a good Westin+ quality. 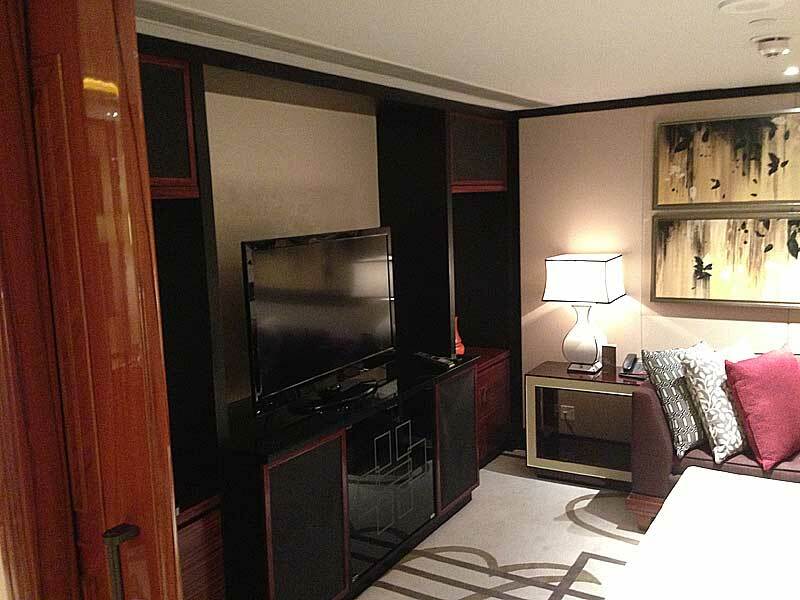 I booked a basic room for the 888 HKD special, was upgraded a few days in advance to an Executive Suite, and on arrival to a Deluxe Suite (1,300+ sq ft). 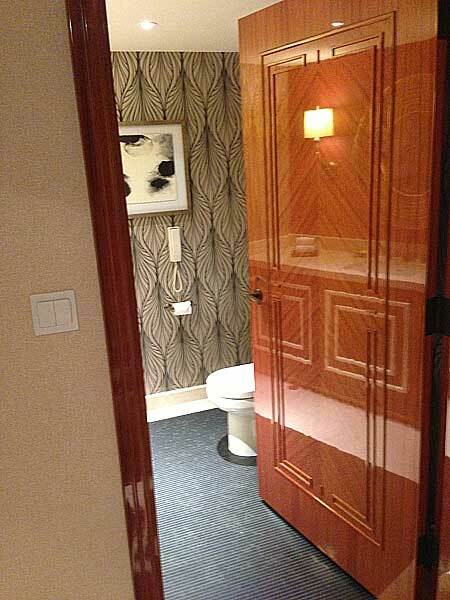 The doors to each room were highly lacquered heavy wood doors. Furnishings and appointments very nice, I am surprised this was branded a Sheraton. Then again, looking at the photos I am surprised the Holiday Inn wasn't branded an Intercontinental. It appears to me that as these hotels are all part of the Sands-Cotai project, they wanted one high-end (Conrad), one medium-end (Sheraton), and one lower-end (HI) hotel brand to appeal to everybody that comes. 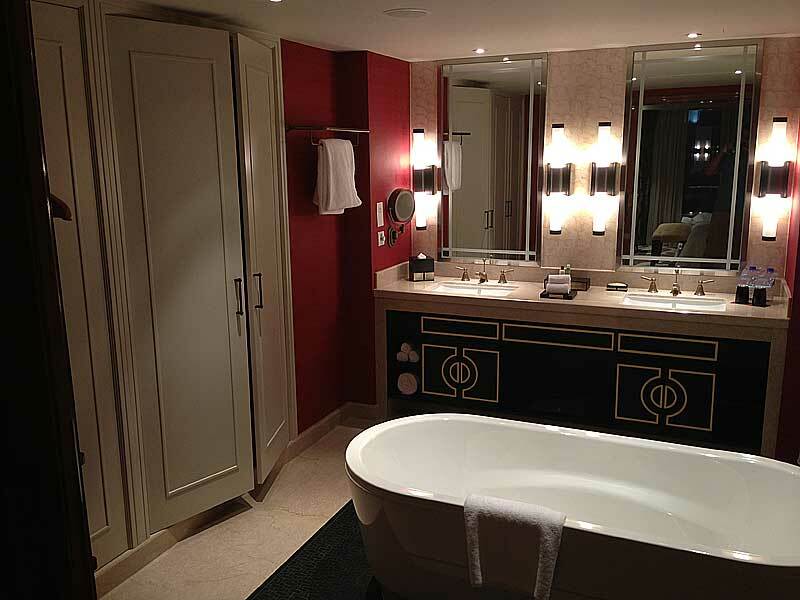 But, there seems to be a commonality between all of the hotels in design. The Conrad is on par with other Conrads, the Sheraton is nicer than any other Sheraton I have been to (Seoul D-Cube is a darn nice Sheraton too), and the Holiday Inn, well, this is "not your Dad's Holiday Inn". I was very surprised to learn the the Sheraton has the largest amount of hotel rooms (3,863) of any hotel in Macau, it is also the largest Sheraton AND Starwood property worldwide. Surprised, because it doesn't feel that large inside, and certainly looks nowhere as monstrous from the outside as the Venetian or the Galaxy. This was a quick transiting stop, had to leave at 6 AM, and therefore didn't have a chance to see the club lounge, which is supposed to be very nice and huge (250+ seats? ), nor try the breakfast there. Wow. Thanks for the update. I'll be there next week to check it out. It appears to me that as these hotels are all part of the Sands-Cotai project, they wanted one high-end (Conrad), one medium-end (Sheraton), and one lower-end (HI) hotel brand to appeal to everybody that comes. How was the club lounge at the Sheraton? The one at the Conrad was fabulous with both Moet & Chandon & Piper-Heidsieck during the happy hour. (Sorry, I didn't see your comment about the club lounge) It would be interesting to see how the Sheraton one compares to Conrad's. Had a one night stay at the Sheraton on the special HK$888 rate last weeked. I'm SPG Plat and was upgraded to the Deluxe Suite upon arrival (same suite as the above poster). Checkin was slow as the SPG elite queue was not manned, and was directed to the main checkin area. Checkout was also slow (I did this at the Lounge, but there were also massive queues there). They did not check IDs of the lounge guests, and we just walked in (along with what seemed like another 20 people). Tried to call the concierge from the room (internal extension), but waited on the phone for 20 minutes. In the end, had to make an external call to the Sheraton's main line before being able to get through. They wanted to charge me for the phone calls, but I pointed out that this was their own line, and the charges were removed. Would definitely stay again, once the hotel has sorted out the checkin/checkout procedures. At the concierge desk they have an "express checkout" dropbox for your key. I just dropped my key in there and was on my way. This was nice, as most hotels in Asia want you to physically check-out, unlike the US where you can just leave without doing anything.